Web design is a part of any companies brand and a major part of the company’s marketing strategy. 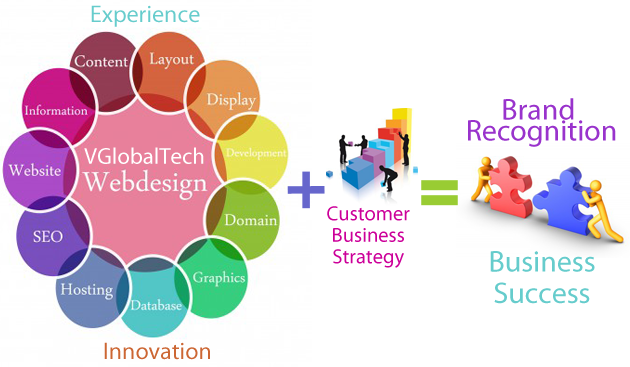 Since all companies use their websites differently, VGlobalTech utilizes a unique approach to each web design project. Experience and Innovation are the necessary ingredients to an awesome online presence. If one is missing you end up with a stale webdesign and a boring online presence that does not attract traffic let alone convert them into customers!!! The V team believes in understanding a client’s marketing model, product or services, and target market before starting a project. Once the V team has identified and researched these issues we then plan the company’s website strategy. Our goal is to give the highest return on investment and to do that successfully, we also need to understand how a company measures it success and work towards that goal. Every project is assigned to a team which will work one on one with the client to develop their website; this allows us to give you the best possible website while keeping your overall goal in mind. Each of our teams consist of a Project Manager, Graphic Designer, and Web Developer.